One of those things that seem so obvious you hardly need a recipe. But it’s handy to have one for reference. This is from Taste & Create partner Ginny’s blog, and even though I now have some cup measures I’ve converted it to metric weights because, well, how do you measure a cup of butter? 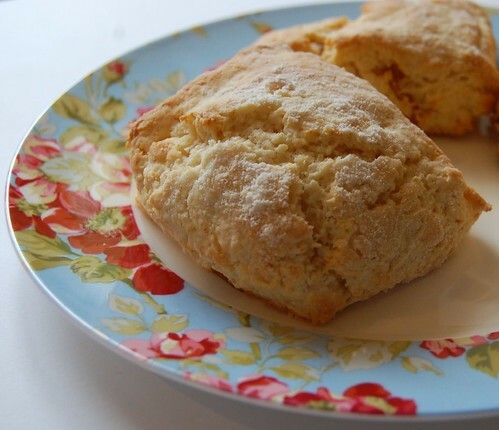 Scones aren’t as easy as you might think. The key is to mix/handle the dough as little as possible. Don’t roll it out; as soon as it holds together, tip it onto a floured work surface and pat it out with your hands. Not too thin; it should be about 2 cm thick. Then cut into triangles or squares with a sharp knife. They might not look as elegant as round ones made with a cutter, but they will be lighter. Sprinkle a little flour on top before putting in the oven. 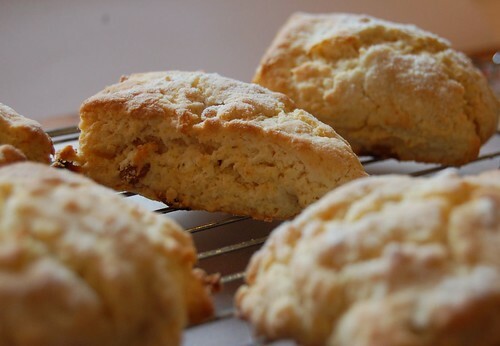 If you have any buttermilk or even milk that’s gone sour in the fridge, your scones will be even lighter. I sometimes substitute yoghurt for part of the milk. You have to eat them the day they are made, preferably when they are still just warm. Ginny likes hers with honey, but being British I consider that you can only eat them spread with home-made strawberry jam, with a generous dollop of clotted cream on top. Or crème fraîche if you can’t get clotted cream. And a cup of tea of course! Mix flour, salt and baking powder together. Cut in the butter using a pastry cutter or two knives until the butter is in very small pieces and fully incorporated. Use your fingers to finish if necessary, but don’t overdo it. Add the sugar and sultanas and stir to blend. Make a well in the middle and pour in the milk. Mix until it holds together in a ball. Dough will be sticky and moist; if it isn’t, add a very little more milk. Place on a floured surface and pat into a rectangle with floured hands, until it is about 2 cm thick. Cut into squares or triangles (Ginny somehow made 16 out of this quantity; I ended up with 8 nice big scones). Put on a lightly greased baking sheet, sprinkle sparingly with flour, and bake for 8-10 minutes until browned. Cool on a wire rack till lukewarm, and serve however you like. I’m glad you liked the recipe! It has me craving scones again!